The 2nd half almost seemed as if the Knicks were toying with the Pistons. At least 3 times Detroit would come to within 8-10 points and then the Knicks would go on a big run. Carmelo was unstoppable today. When he’s scoring from inside and out as well as passing when he’s double-teamed there isn’t much you can do. Welcome back Steve Novak, we missed you. Camby looked a lot more mobile today. Hopefully this means he’s getting into game shape. We need another rebounder out there. Can someone start a movement to ban Rasheed Wallace from taking shots more than 12 feet from the basket? Jason Kidd is more important than people realize. In the 2nd quarter Detroit made a run and almost came back to tie the Knicks. Kidd enters and suddenly the Knicks are up by 20. This is not the first time something like this has happened. The Knicks were real solid from the line tonight, something that was a weakness up until today. 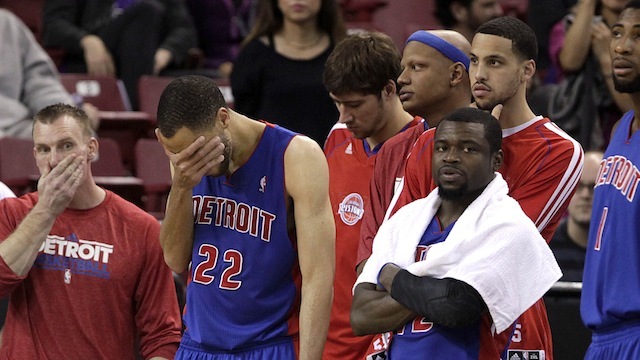 Detroits three highest paid players come off the bench. I’m going to go out on a limb and say if half of your salary is spend on 3 players who barely produce you’re not making the playoffs. Remember when Detroit wanted to build the roster around Stuckey? It hasn’t been confirmed yet but I believe Charlie Villanueva got a stat other than a DNP-CD today.